Several years ago, the Catholic Church required women to wear a head covering in order to enter the sanctuary. One Sunday a lady arrived without her head covering. The priest informs her that she cannot enter without it. A few moments later, the lady re-appears wearing her blouse tied to her head. The shocked priest says, "Madam, I cannot allow you to enter this holy place without your wearing a blouse." "But Father, I have a divine right," she informs. 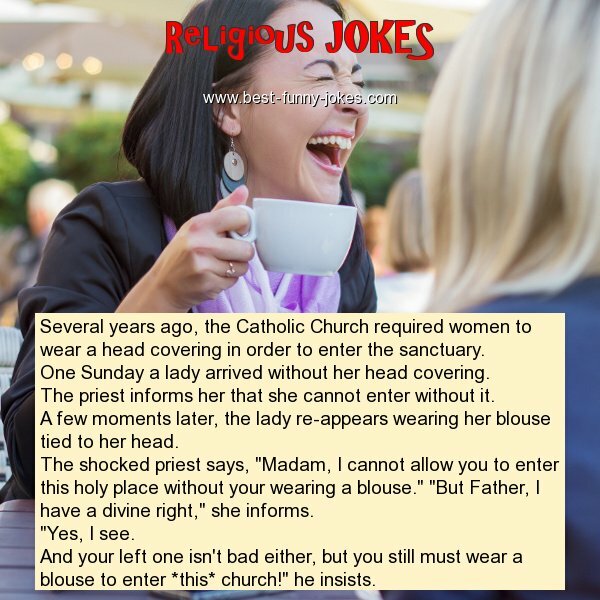 And your left one isn't bad either, but you still must wear a blouse to enter *this* church!" he insists.